Swiss Post assumes its responsibility for people and the environment in procurement too. It firmly believes that a fair supply chain benefits everyone: producers, suppliers, partners and finally you too. Swiss Post is fully committed to supporting sustainability. Together with our partners and suppliers, we assume our ecological and social responsibility in the supply chain too. We demand modern standards for the procurement of the necessary goods and services. That is why we prefer partners who build their corporate policy on a holistic approach. And we demand that our suppliers comply with the Swiss Post Code of Ethics and Social Responsibility (PDF, 157 KB). Among other things, they are required to respect human rights, the prohibition of child labour, adequate remuneration and ecological principles. We are certain that, together with our partners and suppliers, we can improve the sustainability of the supply chain considerably. Swiss Post increasingly puts sustainable procurement into focus throughout the entire value chain in its sustainability strategy. In the future, social, ethical and ecological criteria will play an increasingly important role in procurement transactions. Unsustainable procurement involves risks along the entire value chain both for people and the environment as well as for Swiss Post. To identify such risks in good time, we assess each life cycle phase of high-volume goods and services for possible sources of risk of non-compliance with ecological or social standards. Working on such a basis, effective measures can be developed and implemented. These include the definition of sustainability criteria which can be incorporated into public service tender. In 2012, as Switzerland’s leading major corporation, Swiss Post signed the declaration for membership of the Fair Wear Foundation (FWF). By becoming a member of this global organization, Swiss Post is committed to the strict inspection and sustainable implementation of social standards at its clothing suppliers. Every year since 2014, Swiss Post has been one of only ten companies worldwide to be awarded Leader status by the FWF Foundation. Independent agencies confirmed that the roughly 200,000 items of clothing which Swiss Post sends out every year to its employees entitled to clothing are produced in fair conditions. The controls carried out by the FWF focus on socially responsible work conditions at production sites. Already at the end of 2015, 100% of Swiss Post’s purchase volumes for work clothes had been checked, including 67% by Swiss Post itself, 11% by ILO Betterwork, and 22% by FWF. Swiss Post performed very well: The work conditions on the production sites are good, the entire supply chain – from the material to the finished item of clothing – boasts full cost transparency and no complaints were reported to the FWF by workers in the factories of Swiss Post’s suppliers. Furthermore, Swiss Post has visited numerous suppliers on site and organised training courses for employees concerning their rights and the eight International Labour Organization (ILO) standards. We launched “A second lease of life for Swiss Post clothes” because what happens to old Swiss Post clothing is important to us. Since 2015 we have been working with the Swiss Red Cross in the Bern-Mittelland district to give old Swiss Post clothing a second lease of life. The first stage involves sorting the clothes according to their condition, and removing the Swiss Post logos. Nearly-new clothes are sold by the Red Cross in its second-hand shops. As a result, even people on a small budget can afford good-quality clothes. Good-quality clothes with small defects are also donated to Swiss Mountain Aid via Tell-Tex. Mountain farming families receive the clothing for free. Items of clothing that can no longer be worn are thermally recycled. Within the context of the programme, a so-called «upcycling project» was realised for the first time in 2017: Employees of a protected manufacturing facility turn Post jackets that can no longer be passed on into little bags. In this way, the jackets can continuously be used as a high-quality product, and waste disposal is avoided. 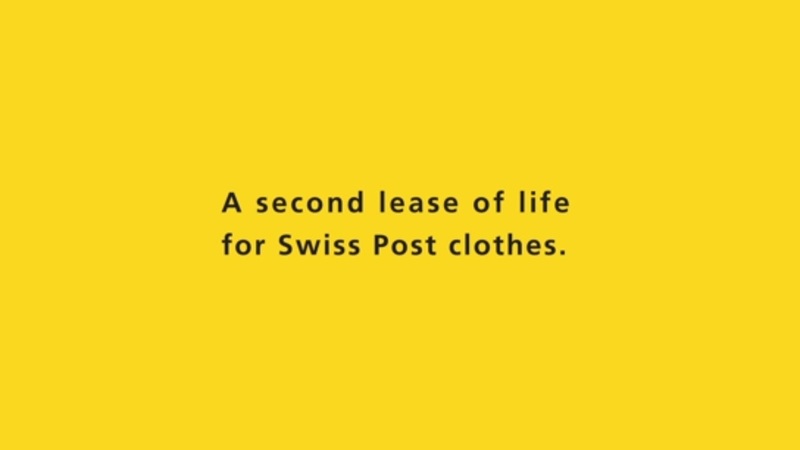 Find out more about “A second lease of life for Swiss Post clothes” in our film. For ecological and economic reasons, we replace our vehicles on a regular basis. In the area of procurement, we place great emphasis on environmental compatibility, alternative drive systems and state-of-the-art engine and exhaust emission control technology, thereby making our fleet of vehicles increasingly economical. Our entire fleet of gas-powered vehicles, including some 100 delivery vans, runs on certified biogas. As the leading public transport company in Switzerland, we are also testing five hydrogen-powered buses. Swiss Post focuses on renewable energy sources. Since 2008 Swiss Post has obtained all of its electricity from renewable energy sources, and since 2013 from “naturemade basic” certified sources. Of this mix, 5% is high-quality, “naturemade star” certified green power produced by wind turbines on Mount Crosin in the Jura canton and from various farms, small businesses and small ecological hydroelectric power stations throughout Switzerland. Swiss Post is committed to constructing buildings that consume very little energy. To this end, we comply with the Minergie standard as a minimum requirement while paying attention to the rational use of energy and the well-being of users. Thanks to technological progress, energy consumption in the printing sector was reduced by 72% compared to the previous year, which amounts to an annual saving of approximately 1.3 million kilowatt hours and around CHF 193,000. By doing so, Swiss Post is making a significant contribution to environmental protection. Fair Wear Foundation (PDF, 209.1 KB)Document is unavailable. Clothing purchasing - FWF report 2012 (PDF, 1.1 MB)Document is unavailable. Clothing purchasing - FWF report 2013 (PDF, 449.6 KB)Document is unavailable. Swiss Post Performance Check 2012 (PDF, 488.2 KB)Document is unavailable. Swiss Post Performance Check 2013 (PDF, 958.2 KB)Document is unavailable. Swiss Post Performance Check 2014 (PDF, 957.6 KB)Document is unavailable. Swiss Post Performance Check 2015 (PDF, 970.5 KB)Document is unavailable. Swiss Post Performance Check 2016 (PDF, 991.6 KB)Document is unavailable. Swiss Post Performance Check 2017 (PDF, 978.8 KB)Document is unavailable.